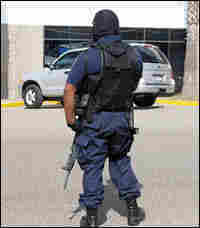 Drug-Related Violence Rages In Tijuana, Mexico Mexico's bloody drug war is raging just across the border from San Diego. Tijuana is suffering one of the worst waves of violence in decades. So far this year, more than 400 people have been killed, and Tijuana's mayor has called on Mexico's government for help. 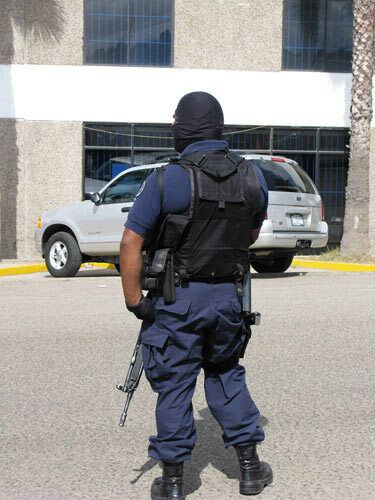 A Tijuana police officer guards a vehicle with five dead bodies in the back. On this day a total of 10 men were found executed across Tijuana in that city's escalating drug war. The Mexican government has been cracking down on the nation's powerful drug cartels, and violence is reverberating across Mexico. In the past week, police found some 60 people executed in Tijuana, the town just across the border from San Diego. The dead appear to be members of rival drug gangs. "In all the years that I've been covering this, this is the worst wave of violence," says Vicente Calderon, a veteran TV reporter who has worked in Tijuana since the early 1980s. For five days in a row, he was called in to cover another mass execution. One day, it was a dozen dead outside an elementary school. The next day's victims were found in vats of acid. On Saturday, police discovered a Ford Explorer loaded with five corpses in the back. So far this year, more than 400 people have been killed in Tijuana in drug-related violence. There are so many unclaimed bodies at the morgue that officials there are looking to transfer some of the cadavers to another facility. Mayor Jorge Ramos Hernandez says part of the problem in his city right now is that members of the local police have been working for years to help the cartels smuggle drugs into the United States. Ramos says he's cleaning out Tijuana's police force. He also called on the federal government to help his city combat the drug cartels.